By way of explanation for my preoccupation and paucity of publication of late, I finally made it back home today after my trip to the US with ForgeRock. We had a varied and busy trip that included several visits to potential customers and partners. I also had the chance of dinner with James Gosling and an interview with Robert Scoble, as well as many press engagements. There’s no doubt that interest in OpenAM is strong. 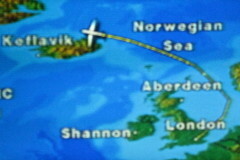 Both journeys were affected by the unpronounceable Icelandic volcano. On the way out, we had to route round the ash cloud, so the plane was 4 hours late departing due to the inbound flight doing the same, and then we flew first almost to Stavanger (home of so many colleagues) and then north of Iceland – you can see the route from the airshow screenshot. We eventually arrived in San Francisco about 7 hours late. On the way back, the flight Monday was canceled completely and I found myself in an airport hotel at SFO. Then Monday morning I went to the United check-in and was faced with a day on standby. Fortunately I’d already browsed flight alternatives and was able to “help” the agent find a pairing with standby seats via Washington DC. Providentially, both segments not only cleared but also upgraded and I was able to fly home in relative comfort. Thanks to Jasmine at SFO Red Carpet Club, who was able to achieve in moments what a Global Services agent found too hard.